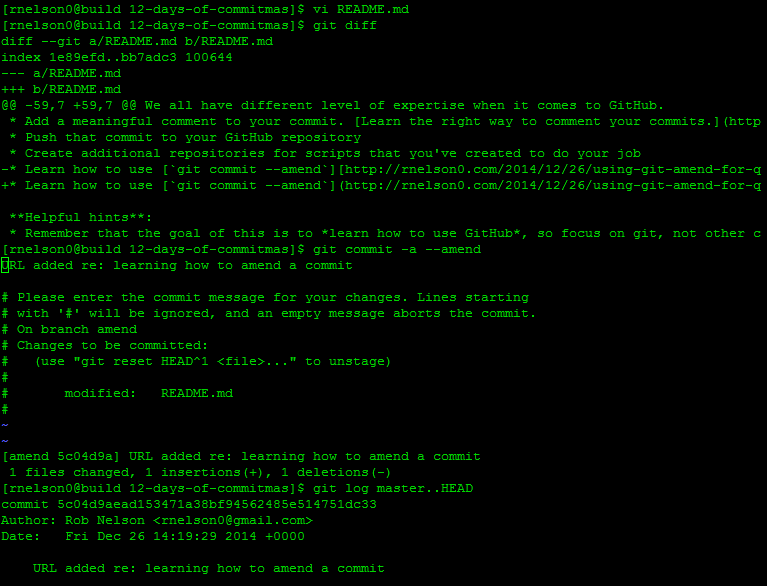 Git amend is pretty simple. Just make another edit and add —amend (that’s two hyphens) to your commit command. An editor will open where you can update the commit message. Since this is a typo and the purpose of the commit hasn’t changed, I just hit ZZ to save without editing and git processes the amend command. Just like when rebasing, notice that the commit checksum has changed. If you had already pushed to origin, you would now need to add -f to force overwriting the remote’s commit history. This is a lot simpler than rebasing. Amending is appropriate when tweaking the previous single commit with changes that are similar to the described purpose of the commit – typos, syntax corrections, steps you left out entirely – and inappropriate when making unrelated changes that deserve their own commit. Rebasing is appropriate when consolidating discreet commits into fewer commits to express a relationship between multiple changes or simply to make the history a little nicer and easier to review. Your judgement, combined with the project’s guidelines, should help determine the correct course of action.